A Portable Outdoor Heater, Powered by Wood Pellets! 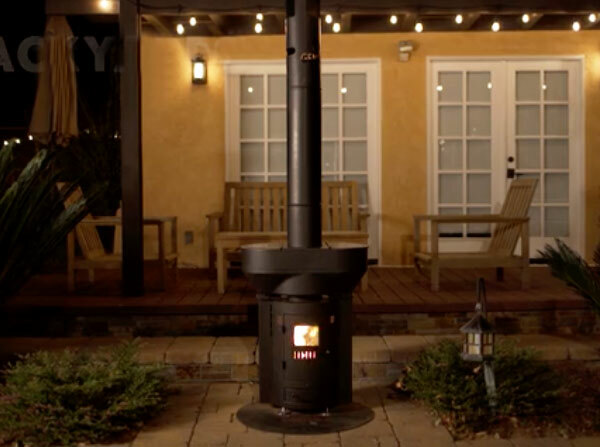 This kickstarter campaign recently launched in order to fund the creation of a portable wood pellet fueled outdoor heater, which is easy to take apart and re-assemble. The inventors claim it provides double the heat of a propane heater, at 1/10th of the cost. The Q-Flame may be used for outdoor activities, backyard party heat, or even as a helpful tool when the electricity goes out. It’s inexpensive to operate, uses no electricity, and is environmentally friendly. Could you see yourself using a product like this? Heavy snow buildup can definitely affect your pellet stove’s venting and your burn experience. Wood pellet stoves operate through a system of air intake and exhaust. If this system is hindered by a blockage (or a gasket leak) proper combustion of the pellets can’t happen. Unlike wood stoves, pellet stove venting can be either horizontal, vertical or both. A similar kind of venting is through the wall with a vertical rise (Fig. C). Vertical piping raises the exhaust further up the exterior wall. This kind of setup holds less risk of snow blockage. However, strong snow drifts (or very high snow accumulation) can still create blockage. Pellet stoves can also have exhaust vents exiting through the roof – with some variations (Fig. D). If your roof has heavy snow piled up that hasn’t slid off or been pushed off, the vent could be blocked. Make sure to check for blockage – no matter how your stove is vented. A whole other way your burn experience can be affected by snow is through delivery obstacles. Our Woodpellets.com delivery trucks park on the street, and bring your pallets up your driveway with a forklift. Of course, there is nothing you can do about large snowbanks taking up space on the road, but you can make sure your driveway is plowed enough for our 8 foot wide forklift. This will help the driver make a successful delivery – and help you avoid delivery delays. Please let us know if you have any questions. Call 1-800-PELLETS to speak to an expert!